The Washington County Board of Education (WCBE) has a National Pollutant Discharge Elimination System (NPDES) permit for Leroy High School, located in the community of Leroy, Alabama. There is no public sanitary sewer system in this area, therefore the school system is required to treat and dispose of all wastewater generated by the school. The NPDES permit allows the school to discharge treated wastewater to an unnamed tributary to Gaines Creek in Washington County, Alabama. McFadden Engineering designed a membrane bioreactor (MBR) treatment facility that replaced the school’s Fixed Activated Sludge Treatment (FAST®) plant and chlorine addition system. Wastewater is collected from the school and adjacent school buildings and gravity flows into an influent pump station. From the influent pump station, water is pumped to an equalization pump station with a basket screen to manually collect and remove large debris. From there, water flows to a 10,000-gallon equalization tank with the effluent pipe located at the top of the tank allowing solids to settle and collect at the bottom. Water then flows to a membrane bioreactor (MBR) feed tank where it is pumped to the Huber smartMBR waste water treatment plant. The MBR system provides high effluent quality at economical costs for the school. MBR is a proven advanced wastewater treatment technology that combines biological treatment with membrane filtration to produce high quality effluent. The MBR is a suspended growth-activated sludge system that utilizes microporous membranes for solid/liquid separation instead of secondary clarifiers. A Huber smartMBR was chosen for this process and installed at the site in 2013. 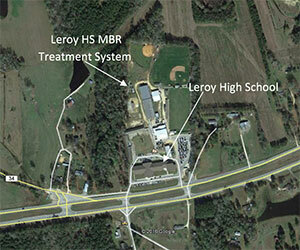 The MBR operating at Leroy High school was sized for a peak flow of 20,000-gallons per day. The treated effluent is discharged to a pump station that pumps the water to the discharge location.